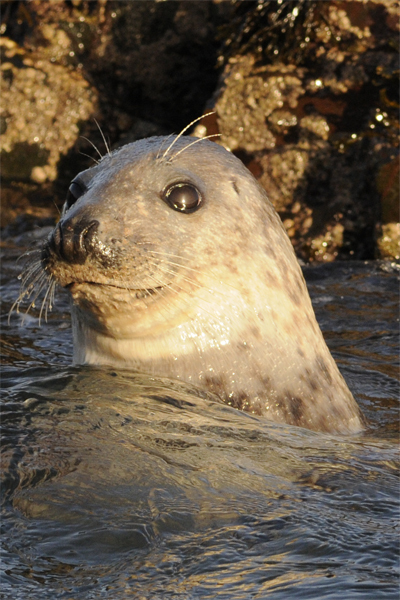 After postponing our Seal and Seaduck Special last Saturday (sea conditions were ideal, but it would have been really irresponsible to encourage anyone to drive on Northumberland’s roads at the time) we arrived at Seahouses Harbour yesterday morning ready for our final boat trip of the year. Everyone was well wrapped-up and we were soon boarding Glad Tidings VI. As we sailed out of the harbour a veritable battery of long lenses was produced in readiness for the anticipated wildlife. With a skipper and crewman with excellent eyesight and wildlife-spotting skills, 2 NEWT guides, and clients with sharp eyes as well, the boat was soon being manouvered to offer the best possible opportunities to view or photograph the wildlife. After 13 years of organising offshore wildlife trips we know the importance of the skipper to the success (or otherwise…) of the trip and, with Craig and William, we were in excellent hands. 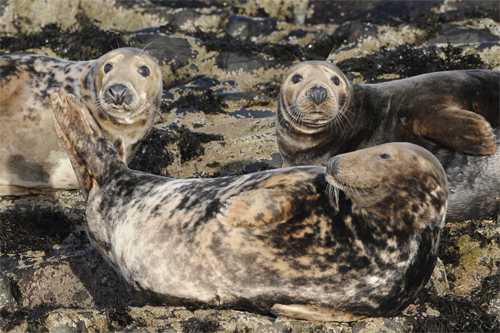 The first half of the trip concentrated on the Farne Islands themselves. 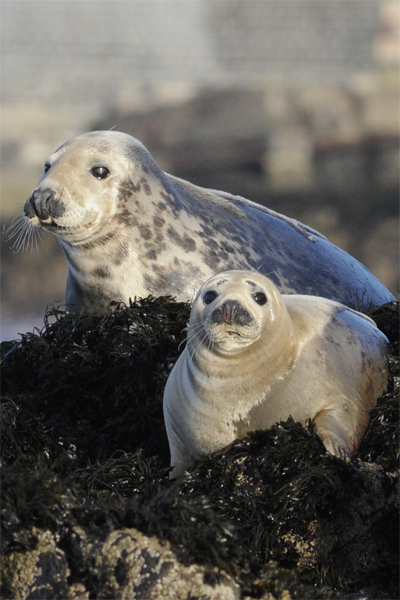 A lot of the Grey Seals had well-grown pups, quite a few of the adults were moulting and there were a couple of cow seals still heavily pregnant. Shags were sitting around on the islands, Little Auks were bobbing about like corks in the increasing swell, and we had a brief view of a Black Guillemot as it flew from Gun Rock towards Inner Farne. Heading north we enjoyed the sunny (but cold) weather and scoured the sea just south of Holy Island. Plenty of Eider were sitting around, along with a pair of Scaup and several Red-breasted Mergansers but a Slavonian Grebe near Guile Point proved elusive. Red-throated and Great Northern Divers were seen but in much smaller numbers than we would normally expect. 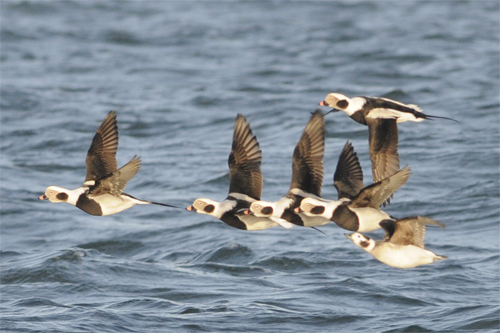 The journey back down the coast featured one of our favourite birds; Long-tailed Ducks were sitting around in groups of 10-15 and offering some excellent photo opportunities. 30 or 40 Common Scoters proved a bit more skittish and didn’t come near the boat. 2 Gannets were a bit of a surprise before we returned to the harbour. 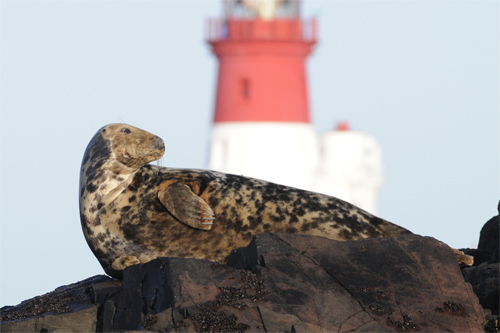 On Friday I chaired a committee meeting of the Southeast Northumberland Tourism Association. As a new project, all of the committee are putting in a lot of effort and our AGM will be in February, the website should be up and running soon and we’re designing a leaflet to highlight the tourist attractions in our area. On Sunday we carried out our WeBS count (a week late but the Birdwatching Northumberland Press Trip coincided with the scheduled count date). Northeasterly winds at the start of the month have deposited huge volumes of sand a long way up the beach (and along the footpath in Cresswell village) almost to the height of the dunes in some places. The highlight was a loose group of divers on the sea, 15 Red-throated, 2 Great Northern and 1 Black-throated. As we approached the Chibburn mouth, the end of our survey section, Sarah commented on the sheer walls of sand next to the Chibburn as it wound it’s way down the beach. Not surprisingly, Sarah took the sensible approach and walked well away from the edge…at least I earned some brownie points by removing Sarah’s ‘scope and tripod from my shoulder and throwing it clear as the sand gave way beneath my feet. Now I’ve got a day in the office and it’s gloomy and overcast. Two Jays and a Great Spotted Woodpecker are in the apple tree and Siskins have started visiting the feeders (after merely flirting with the boundary of our garden earlier in the winter). Lesser Redpolls are still around the edge of Choppington Woods. Can we set a new high total for our garden when it’s the Big Garden Birdwatch next weekend?